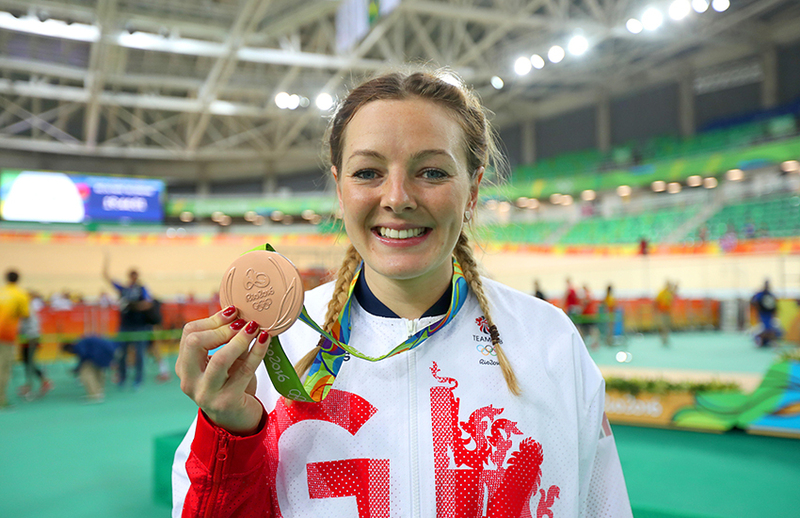 In 2012 Katy Marchant was competing in heptathlon and cycling was the furthest thing from her mind. With less than four years of racing in her legs Marchant surprised many when she claimed bronze in the sprint in Rio. Six years on Marchant is one of the world's best sprinters with Olympic and Commonwealth Games medals among a growing collection. Mid way through the 2020 Olympic qualifying cycle Marchant has her eyes on Olympic gold in Tokyo. The retirement of Becky James following the Rio Olympics and injury to Victoria Williamson left Marchant as the most experienced sprinter on the Great Britain Cycling Team. A break following the long 2018/19 season gave Marchant time to prepare for the 2019/20 season, where she has claimed her best World Cup results to date. A sixth place finish in the sprint at the London World Cup equalled her best performance at a World Cup. Before a silver medal in the keirin in Cambridge, only pipped on the line by Wai Sze Lee, also equalling her best World Cup result. Marchant now heads to Hong Kong for the final round of the World Cup season, where she will compete in the sprint and keirin and reunite with a returning Victoria Williamson in the team sprint as they chase Olympic qualification points. Back in 2012 you were still competing in heptathlon and were initially a bit hesitant about the switch to track cycling is it hard to believe how far you have come in the six years since then with Olympic and Commonwealth Games medals? Yeah absolutely. It's definitely been a bit of a whirlwind, one that I am absolutely loving though. To compete an Olympic Games so early into my cycling career was a huge confidence boost and then to win a Medal. I think that was clarification I had made the right decision. You did a lot of racing leading in to Rio Olympics with World Championships, European Championships, World Cups and UCI events, for someone who was new to the sport and didn't come up through the junior ranks how important has it been getting all the experience and learning tactics? This was definitely the hardest part for me. And I think it's something I will never stop learning. Like you say, I lacked a lot of racing experience having not had a cycling background, so I think it was massively important that I spent the first few years going to as many races as possible to learn all about it. 2017/18 was a very busy season that culminated with the Commonwealth Games, where you claimed bronze in the team sprint what was your first Commonwealth Games like? If I'm perfectly honest, my first commonwealth games were a funny one. It came after a very long racing season that I don't think I was physically or mentally prepared for. We had been to Australia earlier in the year to have a look about and get some training done on the track which was really good, but I think by the time it came around I wasn't where I needed to be. Don't get me wrong, to ride for team England and experience the 'games' atmosphere again was really cool and obviously myself and Lauren managed to get ourselves a bronze medal in the team sprint which again we were super happy with. I also learnt so much about myself as an athlete throughout that time, that it will always stay with me and I'm super grateful to have experienced that. You have won Olympic Bronze, Commonwealth Games bronze, World Cup medals and European titles and medals though a medal at World Championship level has proved elusive is that something you think about or is your focus firmly on Olympic gold? When you put it like that, I guess it does look pretty elusive. Ha but I think it's hard to say. I'd not won many senior medals before the Games, so I think that came as a surprise to many people and then after the games it actually look me quite a while to get my mojo back. This has by far been my strongest season and I already feel a million times better than I did this stage in the last Olympic cycle. Obviously, my focus is on the Olympics 100% but I definitely wouldn't say no to a world championship medal along the way. In the last two and a half years women's sprinting has seen the retirements of Anna Meares, Becky James and Elis Ligtlee and with the injury to Kristina Vogel you are the only rider from the women's sprint and keirin podiums in Rio still competing. Does it feel like we have seen and are seeing a changing of the guard in women's sprinting? Women's sprinting has definitely moved on. You only have to look at qualifying times we are seeing now throughout the World Cup season. The girls are always getting faster and it is ace to be a part of that challenge. Now you've said that, I feel old. However, I was definitely on the podium in Rio with some of the most historic women in track cycling so I'm alright with that. This season you have had some of your best World Cup results in the sprint does that give you confidence with how you are going and improving heading towards Tokyo? Yeah absolutely. This season is definitely going in the right direction, I'm still not where I want to be and I'm hoping to use New Zealand and Hong Kong to help me get where I need to be for this year's world championships. But I definitely feel I'm on the right trajectory towards Tokyo. In the team sprint you have been riding with Lauren Bate who only stepped up from juniors at the end of 2017. Great Britain is currently 10th in the qualifying rankings just outside the top 8 needed to qualify a team sprint spot how is the qualifying process going for you so far? Yeah team sprint has been a tricky one for us. Obviously, we needed someone to step up from the juniors as we were very limited on riders. We've spent a bit of time swapping positions and trialling a few different things, but we've had some good results this season in the world cups and hoping for some more good results over the next few world cups. Had a training camp in Australia ahead of the Cambridge and Hong Kong World Cups how are you feeling heading in to 2019 and what are your goals for the final World Cups of the season? Melbourne was great, a nice bit of winter sun and a solid training block after racing the first four World Cups. Nice to get out on the bike in shorts instead of the usual thermals. The World Cups are just to help my preparation for the world championships, race practice and a chance to practice a few different things. Also hoping to get good team sprint points in the bag to help with that qualification process for next year. With yourself, a rapidly improving Lauren Bate, Victoria Barnes back from injury and Shanaze Reade also returning you have some depth in the women's sprint squad that you haven't had for a few years. How important is that as you head towards Tokyo and beyond? For me it's exactly what I needed. I think it took me so long to get back on track (no pun intended) after the games because I was flying solo. Having Becky retire after Rio was tough, we had spent a lot of time together racing all over the world and to me she was a bit of a leader and someone I looked up to. Now I suppose I'm the experienced rider and that was a strange feeling for me at first. It's great to have a bigger group of girls at training every day to keep raising the bar ahead of what is going to be a big year. Last Olympic cycle you were very new to the sport and didn't have the expectation on your shoulders. Now as an Olympic medallist and with the progress you have made since how does it feel as the experienced women's sprinter with less than two years to go? I'm currently having the best time, and I'm loving taking on every challenge that I am faced with. Need I say anymore?